I recently added some data from Churches and Church Membership in the United States, 1990 to my election/demographics map. Collected by the Association of Statisticians of American Religious Bodies (ASARB) and distributed by the Association of Religion Data Archives. (1990). 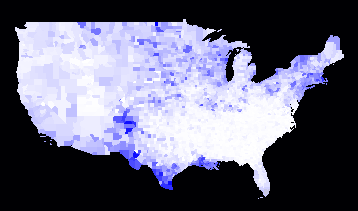 There is data on about 130 denominations, with number of houses of worship, number of adherents, and number of members for (almost) every one, by county. Houses of worship were surveyed, not individuals. “Adherents” is a somewhat looser criterion than “Members”, but the survey allowed the houses of worship to interpret the question as they chose. The combination of self-reporting and self-interpretation means that you probably shouldn’t pay too much attention to the raw numbers. In particular, the respondents might well be over-estimating: Joe’s Church might be counting people who went to Joe’s Church only once. 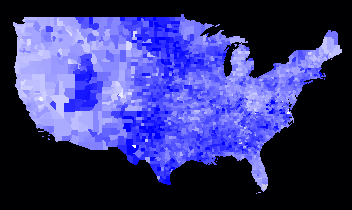 However, I think the relative values across the country are interesting. Here is the percentage of the population in the Continental US that is an adherent to any denomination (remember, as measured by the houses of worship). The more blue, the more adherents. I was a little surprised at how non-churchgoing the West Coast, Florida, and Maine were. 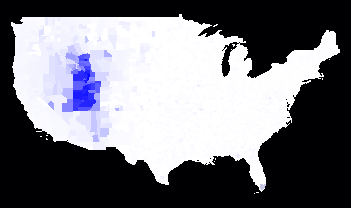 It isn’t surprising how the concentration of LDS adherents is centered in Utah, but I was surprised at how clearly you can see the Utah state borders. 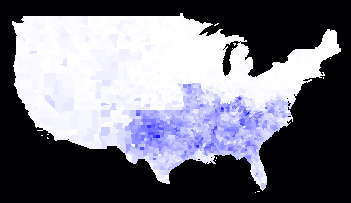 Here is a map of the percentage of the population which adheres to a denomination with the name “Lutheran” in the name. I was surprised at how concentrated the Lutherans were in the upper center of the country. I had sort of thought that a group which had a “Missouri Synod” would have significant adherents in, you know, Missouri. I was amazed at how few Catholics there were in the Deep South. Aside from Latino influence in southern Texas and, to a lesser extent in Florida, plus the French influence in Louisiana, there are practically no Catholics in the south. (At least, not in 1990.) I grew up a few hours south of Chicago, so I rather had the impression that Catholics were ubiquitous. I have a lot more data, but I’m not really sure what groupings make sense. For example, do I group “Holy Apostolic Catholic Assyrian Church of the East” in with “Greek Orthodox”? I have no idea if they have similar doctrines, if they hate each others’ guts, or both. Similarly, I think it would be useful to group together evangelical churches, but I’m not sure how to tell which churches are properly called “evangelical”. Stay tuned.